Home > Recipes + Food > Easy Breakfast ideas > Start the day off right with these DELICIOUS Cheerios & Fruit Breakfast Muffins! A yummy way to start the day! We’ve fallen into a bit of a breakfast rut recently, relying on cereal or toast and a piece of fruit to get the day started. As more and more of it ends up on the floor I decided it was time for a change! 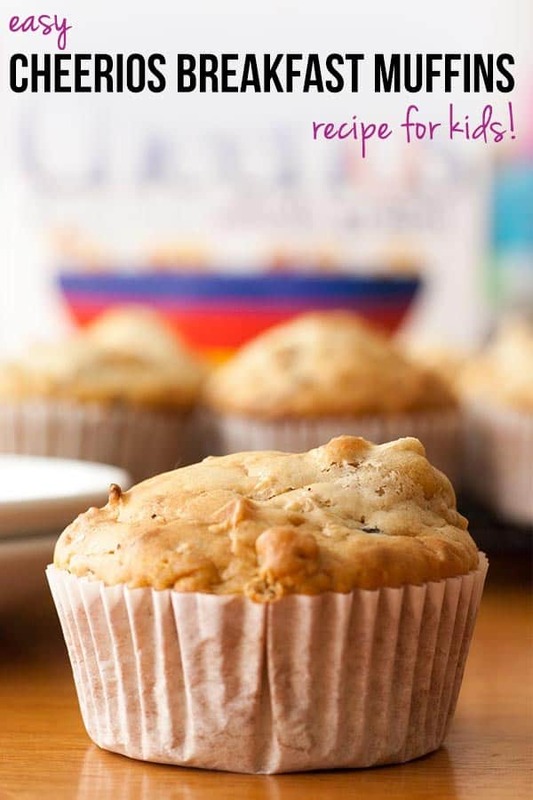 Cheerios were on offer at Costco during our last trip so we have three boxes full in the cupboard, and it seemed a good a time as any to try this healthy kid friendly recipe, which combines Cheerios with some dried fruit in a tasty muffin. It’s a pretty simple recipe so if your kids are old enough they can help you make them. Grab a medium mixing bowl and add the dry ingredients (all except the cheerios and the fruit) and then give them a stir with a wooden spoon. Now grab a large bowl and mix together the eggs, with the vanilla and the milk. Add the Cheerios to the wet mixture a cup at a time, stirring as you go with that wooden spoon. Then once they’ve combined together, start adding in the dry mixture a bit at a time, gently turning over the mixture as you go. You’ll soon see why you need a big mixing bowl for this! Keep gently turning it over until all the mixture is combined, then throw in the fruit. Try not to over-stir your mixture as that can result in rubbery muffins, a lesson I learned the hard way! Now line your muffin tin with paper cases and spoon the mixture in. You should have enough to fill 12 cases almost to the top. Pop them in the oven for about 15-20 minutes. You should check them half way through and turn the trays around so that they cook evenly. Keep a close eye towards the end of the time, you want them to be golden brown but not burnt! Take them out of the oven and pop them on a wire rack to cool, and then serve them up for breakfast, or a mid morning snack! The muffins will keep for a couple of days in an airtight container. It will take my two quite a while to get through 12 muffins so I froze some in freezer bags; zapping them in the microwave for about 15 seconds should make them perfect for breakfast. If you loved these Cheerios & Fruit Muffins, why not check out our collection of easy smoothie recipes for kids or our egg breakfast ideas! Follow our Meal Planning: Breakfast board on Pinterest. Next PostNext Amazing Adult Coloring Books: Free Printable Pages to Try Right Now!